When financial prepping for TEOTWAWKI, the last thing that might come to your mind is paying down your debt. After all, aren’t there more important things to worry about like staying alive? While that may very well be the case, you need to also prepare for the possibility that the financial system survives, including the IRS, and calamity or no calamity, the creditors will still want their money. In fact, they may be more aggressive in their efforts if it means their own survival. If that is the case, you don’t need the extra worry of one more predator coming after you. There are many disaster scenarios in which people might find themselves cast into survival mode even while parts of the nation’s infrastructure continue to operate. For one, a hyperinflationary episode could result in the collapse of our currency and our society, but banks could live on. Hyperinflation, caused by the loss of confidence in our currency, will drive prices to the stratosphere and, essentially, rob people of their wealth (if it’s in paper assets). Essential goods and services will become scarce leading to black markets, crime, civil unrest and, generally, pitting neighbor against neighbor in order to survive. If you hold a fixed mortgage on your house, you may be in good shape because your debt will be erased by the hyperinflation. But if you hold variable loans or credit card debt, you could see the interest rates skyrocket. Unless you plan to get completely off the grid, your debt will follow you around. 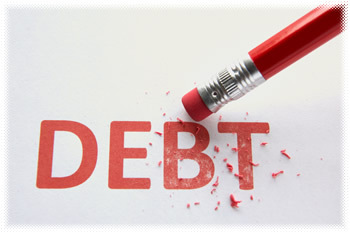 The other important reason why it’s important to pay down your debt now is to reduce your expenses. Financial Prepping is as much about financial preparedness as it is physical preparedness. Debt expense simply reduces your capacity to invest in your preparedness. A car payment or credit card payments can go a long ways to building your stockpiles or paying for skill training. Preppers should be thinking first and foremost about sound cash management and transitioning to a more frugal lifestyle. Budget like you really mean it. If you are truly in the prepping mindset, you need to prepare your budget as if your life depends on it because it might. Cut all non-essential budget items and allocate a portion of your prepping budget to rid yourself of your debt. Get a 0% balance transfer card. At least in the time you still have, you can lower your interest charges so you can apply all of your payment to principal. But, make sure you pay the balance in full before the end of the introductory period. Sell non-essential items. It’s time for a garage sale anyway, so use the proceeds to pay off debt. Get some part-time work. If you have any skills you can put to work hire yourself out for part-time jobs. Under no circumstance should you take out a home equity loan, but you might consider a debt consolidation loan if you can get a fixed rate.